The American Council for an Energy-Efficient Economy is a nonprofit, 501(c)(3) organization dedicated to advancing energy efficiency as a means of promoting economic prosperity, energy security, and environmental protection. The program administrators we reviewed represent many types, sizes, and geographic locations. We find big electricity savings coming from utilities big and small, rural and urban, regulated and deregulated, investor owned and municipal. One of the top performers we highlight is Otter Tail Power in Minnesota. This utility operates in a mostly rural, expansive service territory where the average community size is barely over 300 people. We also highlight bigger utilities like Pacific Gas and Electric in California, which serves over 5.3 million customers. We found big savers in the sunny Southwest (Tucson Electric Power in Arizona) and the snowy Northeast (Efficiency Vermont). The report demonstrates that leaders in saving electricity come in many shapes and sizes and are not limited to large utilities in high electricity-cost states, such as Massachusetts or California. Savings are going up. The cost of saving energy is not. Average savings for those in our study rose from 0.8% in 2007 to 1.8% in 2014 (as shown by the dotted green line in the figure below). During this period, spanning 107 total program years, program administrators achieved savings levels over 1.5% in 25 instances, over 2% in 10 instances, and over 3% in 1 instance. The data also show that high savings are sustainable over time. Of the 14 program administrators reviewed, 7 achieved savings levels higher than 1.5% in consecutive years. Three of the seven sustained that level of savings for more than four years. 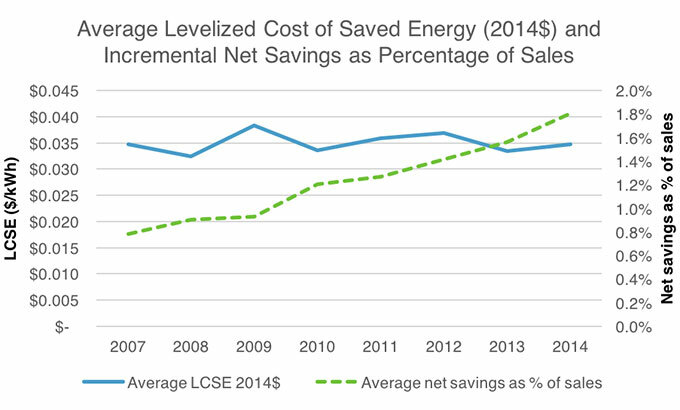 Our review also documents several important trends related to the cost of saving energy. As the figure shows, average savings as a percentage of sales more than doubled from 0.8% to 1.8% while the average levelized cost of saved energy, the per kilowatt-hour cost of energy over the lifetime of a program, remains relatively stable around 3.5 cents per kWh. 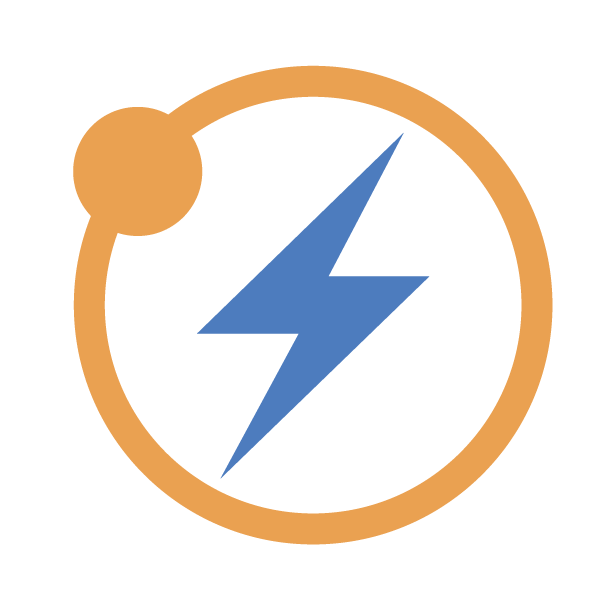 While the levelized cost of saved energy is not a benefit cost test or a cost effectiveness test (the report provides more information on those), it does provide a useful metric to compare various resource options for electric utilities. This finding is significant because it shows that even as savings increased from 2007 to 2014, the cost of savings has not. Big savings are possible in regions with low electricity prices. A common concern we often hear in regions with a low cost of electricity is that achieving high levels of energy savings may not be cost effective. We find this is not the case. Of our 14 big savers, 8 operate in states with electricity prices below the national average. This clearly demonstrates that efficiency is cost effective and works in areas with low electricity prices. For example, Energy Trust of Oregon has offered some of the most successful energy efficiency programs for decades in an area served by low-cost hydro power. The program administrators in our study have also been able to increase savings while natural gas prices have continued to decline. Natural gas is the primary fuel for marginal energy production, which electricity efficiency programs help to displace. Even with the sharp decline in natural gas prices, energy efficiency has remained a cost effective resource. Portfolios are evolving to continue high levels of savings. Our report examines past program portfolios to understand how programs have evolved over time. Lighting, the primary share of savings for many program portfolios in the past, has experienced a reduced share in recent years. This trend is likely to continue and program administrators will need to innovate and evolve to continue sustaining high levels of savings. While some newer programs are becoming more prevalent, the program staff we interviewed reported they will continue to rely on traditional programs to achieve high levels of savings. 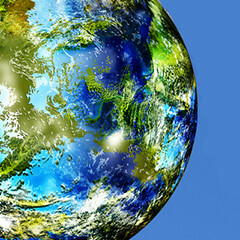 Ultimately, we find that while achieving big savings takes some creative thinking and the ability to adapt to changing regulatory environments and energy markets, program administrators of all types and sizes across the country have established that increasing and sustaining high levels of energy savings is possible. 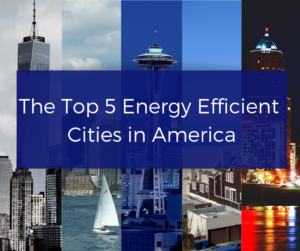 These leaders are committed to achieving high levels of savings in the years ahead, and their documented successes can serve as a blueprint for utilities looking to capture the benefits of energy efficiency. Thank ACEEE for the Post! Two recent acquisitions add an internet of energy solution and intelligent smart hot water tank technologies to the utility’s offering. The biggest story in the world of lighting over the past decade has been the phase-out of inefficient incandescent light bulbs. What makes for a successful home energy reduction program? In Asheville and Buncombe County, North Carolina, a focus on equity, access to data, strong partnerships, and a willing and supportive utility, is producing a myriad of community benefits.